NASA's Orion spacecraft boasts the world's largest heat shield at 16.5 feet (5 meters) in diameter. Image uploaded June 5, 2014. The largest heat shield ever built for a spacecraft has just met its ride — NASA's new Orion deep-space capsule — ahead of the craft's debut test flight later this year. Engineers with NASA and contractor Lockheed Martin worked together to install the 16.5-foot (5 meters) heat shield for the upcoming test launch in December. Called Exploration Flight Test-1, the mission aims to launch an Orion capsule 3,600 miles (5,794 kilometers) into space, then have the craft return to Earth, re-enter the atmosphere and splash down in the Pacific Ocean. The heat shield is designed to protect the spacecraft and future astronaut crews from the 4,000 degree Fahrenheit (2,200 degree Celsius) heat produced when the Orion space capsule is re-entering Earth's atmosphere. The spacecraft's heat shield is covered with a material called Avcoat. The coating burns away as it heats up, but it keeps the crew module cool. "It is extremely exciting to see the heat shield in place, ready to do its job," Mark Geyer, Orion Program manager at NASA's Johnson Space Center in Houston, said in a statement. "The heat shield is such a critical piece, not just for this mission, but for our plans to send humans into deep space." NASA officials have discussed using Orion to bring astronauts to an asteroid towed into orbit around the moon sometime in the 2020s. The spacecraft could also propel humans to Mars in the future. The EFT-1 mission is expected to last about four hours, and it will test many of Orion's critical systems, NASA officials said. The spaceship will make two orbits of Earth and then return to the planet, splashing down in the ocean. 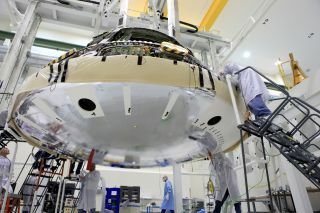 Engineers install the heat shield for NASA's Orion spacecraft. Image uploaded June 5, 2014. The space agency has been readying Orion for the EFT-1 flight throughout the year. The spacecraft's completed service module was stress tested for the last time in February, showing engineers that it can withstand the riggers of its upcoming spaceflight, NASA officials have said. In the next months, the crew and service modules will be transported to Kennedy Space Center in Florida, where they are expected to launch atop a Delta IV rocket for EFT-1 in December.